This month marks the launch of my novella for Barrington Stoke, My Name Is O. I’m coming home to London for party to celebrate. More news on that soon. Meanwhile, my new book is coming along nicely. In fact things here in Tokyo are going better than my partner Laura and I had dared to hope – so we’ve decided to stay longer. After the launch of My Name Is O we’re coming back to Japan until summer 2012 at least. 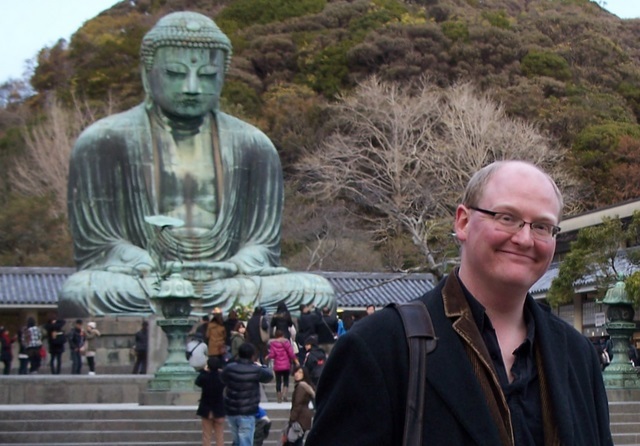 Here above, with some grinning fool standing in front of it, is The Great Buddha of Kamakura. I miss home and friends and family, of course. But, well, I’m in Japan, with the person I love most, writing the most awesome book that I can possibly think of. I’m having one of the best bits of my life so far. I feel very lucky and very grateful.